Cassini image of Saturn and its moon Tethys (upper left). Click to encronosenate. Man, I love these greyscale shots. They’re so moody. Right now it’s summer in Saturn’s northern hemisphere—though at 1.4 billion kilometers (900 million miles) from the Sun and temperatures of -150 degrees Celsius (-240 degrees Fahrenheit) and lower, the term “summer” is definitely relative—with the Sun shining down on the rings from the north. Cassini was below the ring plane in this shot, looking up at them, so they appear a bit darker than they would if Cassini were above them looking down. 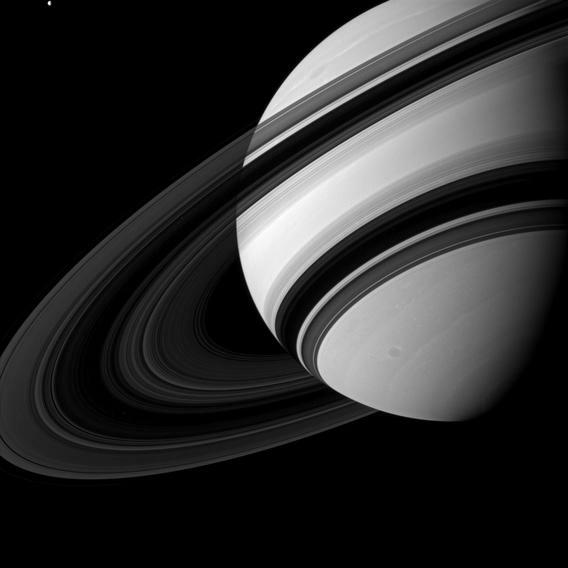 As you can see, Saturn has lots of rings; thousands, in fact! The rings are not solid, but instead composed of countless small pieces of nearly pure water ice, the biggest probably smaller than an average house. Some of the rings are extremely narrow, too: You can see the thin ones silhouetted against the face of the planet itself, looking like piano wires strung across the vast cloudscape. Just below and to the right of the rings you can see their shadow on the cloud tops of Saturn. I’m fascinated by the play of light and shadow on the rings and the planet, highlighting the complexity of the rings. You can also see some storms in the clouds on Saturn; that dark circular one with the bright rim around it is about 4,000 kilometers (2,400 miles) across—about as wide as the continental United States! So big, I suspect, that you might have missed the tiny spark of light in the upper left. That’s Saturn’s moon Tethys, seen here a little more than half full as it’s lit by the distant Sun. But it’s hardly tiny: It’s nearly 1,100 kilometers (660 miles) across, about the distance from Chicago to Washington, D.C.! Our sense of size is dwarfed by objects on this scale. And yet, there we are. Cassini has been circling Saturn and flying past its weird moons since 2004, returning vast amounts of data about the planet and its environment. But for all the knowledge gained, and more yet to come, when I see pictures like this I sometimes wonder if the most important thing Cassini has done is shown us how starkly beautiful and immense our solar system is.